Some children with severe croup get a harsh, tight sound while breathing in. This is called stridor. Loud or constant stridor means severe croup. So does stridor at rest (when not crying or coughing). Viral Croup. Viruses are the most common cause of croup symptoms. Many respiratory viruses can infect the vocal cord area and cause narrowing. Even influenza (the flu) can do this. A fever is often present with the barky cough. Allergic Croup. A croupy cough can occur with exposure to pollens or allergens in a barn. A runny nose, itchy eyes and sneezing are also often present. Inhaled Powder. Breathing in any fine substance can trigger 10 minutes of severe coughing. Examples are powdered sugar, flour dust or peanut dust. They can float into the lungs. This is not an allergic reaction. Airway Foreign Object (Serious). Suspect when there is a sudden onset of coughing and choking. Common examples are peanut and seeds. Peak age is 1 to 4 years. Food Allergy (Serious). Croup symptoms can also be caused by a food allergy. This can be life-threatening (anaphylaxis). Examples are nuts or fish. Drooling, spitting or having great trouble swallowing. Exception: drooling due to teething. Most children with croup just have a barky cough. Some have tight breathing (called stridor). Stridor is a loud, harsh sound when breathing in. It comes from the area of the voicebox. Breathe warm mist in a closed bathroom with the hot shower running. Do this for 20 minutes. You could also use a wet washcloth held near the face. Caution: Do not use very hot water or steam which could cause burns. If warm mist fails, breathe cool air by standing near an open refrigerator. You can also go outside with your child if the weather is cold. Do this for a few minutes. Crying or fear can make stridor worse. Try to keep your child calm and happy. Hold and comfort your child. Use a soothing, soft voice. If the air in your home is dry, use a humidifier. Reason: Dry air makes croup worse. If age 6 years or older, you might decide to use a cough medicine. Choose one with dextromethorphan (DM) such as Robitussin Cough syrup. DM is present in most non-prescription cough syrups. Age over 1 year of age. Give as much warm fluids as needed. Sleep in the same room with your child for a few nights. Reason: Stridor can start all of a sudden at night. Tobacco smoke makes croup much worse. For practical purposes, the spread of croup and colds cannot be prevented. Most often, croup lasts 5 to 6 days and becomes worse at night. The croupy cough can last up to 2 weeks. Stridor is a harsh, tight sound with breathing in. Stridor means the croup is severe. Other Option: Use a wet washcloth held near the face. Can also use a humidifier containing warm water. Caution: Do not use very hot water or steam which could cause burns. 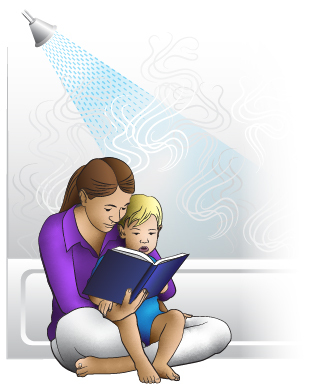 Hot steam can also cause high body temperatures.